People with diabetes have unique issues with their feet. We all have heard the horror stories about people we know with diabetes or friends of friends who developed an ulcer and ended up losing their toes/feet. Most of this is PREVENTABLE. The reason these sort of things happen isn’t because of diabetes itself; it’s because minor injuries are ignored and not managed properly. This article will help you understand YOUR role in improving your health and helping your ulcer heal. As we have already discussed an ulcer is an open sore or break in the skin caused by neuropathy, poor circulation, foot deformities, poor wound healing etc. Areas subjected to weight bearing- ball of the foot, bottom of big toe and heel. We take two to three times our own body weight on the heel when it strikes the ground. Sides of the foot- due to improperly fitted shoes. Back of the heel- from lying in bed. Tips of the longest toes- usually first or second. Mid-foot- if there is loss of foot arch due to foot deformities. Ankle bones- as they are more prone to trauma. Although overall a diabetic has an increased risk of developing foot ulcers than a non-diabetic, there are some other factors that further increase this risk in diabetics. Therefore, it is crucial to identify these factors and follow the preventive measures accordingly to avoid developing a foot ulcer. Neuropathy – the risk of developing neuropathy increases with longer duration of diabetes, older age and poor glucose control. Peripheral arterial disease – the risk increases with longer duration of diabetes, older age, male gender, high cholesterol, high blood pressure, smoking and being overweight. Structural foot deformities – such as bunions, hammertoes, tiptop toe deformity, loss of arches. Calluses – It may overlie an underlying diabetic foot ulcer. The callus tremendously increases pressure on the ulcer area. Therefore, it is important for you to get it removed by your healthcare provider and wear an appropriate orthotic device to decrease its formation. Your doctor will perform a comprehensive foot exam (mentioned in previous article) and place you in a risk category. This is called Diabetic Foot Risk Assessment. It is important for you to ask your doctor about your risk category and devise a preventive and screening plan accordingly. If your feet are in a low risk category, the recommended frequency of comprehensive foot exam/follow up is once a year. For moderate risk, follow up should be every 3-6 months. For high risk, follow up should be every 1-3 months. For an active ulcer, follow up is individualized. Contact your healthcare provider. How can I help prevent Foot Ulcers? By following the foot care routine, the do’s and don’ts of diabetic foot and daily foot self-exams is the cornerstone for preventing diabetic foot ulcerations. (See previous articles) We know that the two most common causes of diabetic foot ulcer are poorly fitted shoes and improperly cut toe nails. So the importance of preventive measures and foot care routine cannot be stressed enough. I’ve developed a Foot Ulcer. Now what? Contact your health care provider IMMEDIATELY. Sometimes despite preventive measures and regular foot care routine, diabetics still develop foot ulcers. But the good news is that healing is possible. It is extremely important that you seek medical help and avoid treating your ulcer at home. The goal of your healthcare team is to help your ulcer heal as quickly as possible to minimize further complications such as infection or amputation. Faster the healing process, the less chance of developing an infection. A multidisciplinary approach, usually by podiatrists, medical specialists, vascular surgeons, dietitians, physiotherapists and diabetes educator in the management of diabetic foot ulcers significantly increases the chance of successful healing and preventing recurrence. There are several key factors in appropriate management of a diabetic foot ulcer. Let’s discuss them one by one. It’s a process by which dead skin, tissue and callus surrounding the ulcer is removed until a healthy bleeding edge is revealed. Adequate wound debridement is an essential step as it helps the ulcer heal faster by removal of dead tissue. It also enables your healthcare provider to see the full extent of the ulcer. After debridement the wound may look deeper and bigger and it should be pink/red in color. There are many ways to do it. Most common is by using a scalpel and scissors to remove the dead tissue and then washing out the ulcer. Your health care provider may use local or general anesthesia for the procedure depending on the extent of debridement. Using special chemicals/enzymes on the ulcer that dissolve the dead tissue. It is usually slow and is ineffective if thick layer of dead tissue is present. Done by putting your foot in a whirlpool bath. Not very effective. Wet-to-dry dressing is applied to the wound where it sticks to the dead tissue, pulling it away when removed. This can be painful and can remove healthy tissue at the same time as dead tissue. Maggots are placed in the wound where they secrete enzymes that digest the dead tissue. Not very commonly used. After debridement, probing of the ulcer is done using a blunt instrument to determine the extent of underlying soft tissue and bone involvement. If bone is encountered while probing, osteomyelitis (infection of the bone) is likely. Your healthcare provider may also take X-rays of your foot to evaluate for bone involvement. Three-phase bone scans and Radiolabelled Leukocyte Scans (See previous article) are expensive but more accurate in establishing a diagnosis. 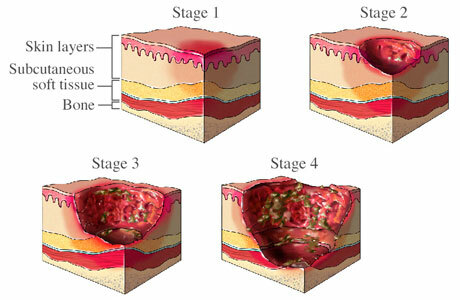 Wound coverage with an appropriate dressing is absolutely essential in management of diabetic ulcers. The old school of thought of letting air get at the wound is now obsolete as it causes more harm to healing. Now we know that if wounds are kept covered and moist, they’ll heal faster. No single dressing is ideal for all types of wounds. Your health care provider may use different kinds of dressing during the healing process of your ulcer. This is most commonly used first. A wet dressing is applied to the wound area and as it dries it absorbs wound discharge. Later on when the dressing is removed, some of the tissue comes off with it promoting healing. They are a good choice for dry wounds as they maintain a moist environment. Calcium Alginates is an absorbent material. It is used for wounds that produce large amount of discharge. Growth Factors are substances that promote wound healing. Specifically used for healthy wounds that have a reasonable healing potential. Useful in managing chronic diabetic foot ulcers. Not useful for ulcers that are infected. The dressing will have to be changed regularly at home. The healthcare provider will advise on how often the dressing needs to be changed and will also show how to change it. Ask them to provide written instructions as well. It is very important to keep the dressing clean and dry. Dressings that are soiled with drainage act as a breeding ground for bacteria, increasing chances of developing an infection. As soon as soiled dressing is noticeable, change it. Make sure to keep the surrounding skin as dry as possible and not too wet from the dressing. This can cause softening of healthy skin leading to further complications. Keeping pressure off the wound area in called off-loading. Foot ulcers need rest in order to heal, especially those on the bottom of the foot. Walking on an ulcer can force it to become larger and increase chances of infection. Off-loading device decreases pressure and reduces irritation to the wound area, speeding up the healing process. Your healthcare provider will work with you to select the device best suited to your lifestyle. It is important to wear these ALL THE TIME even if you are only taking a few steps. In the comfort of their homes, diabetics sometimes choose not to wear them for a few quick steps around the house. DON’T DO IT! Every unprotected step is a day of healing lost. This is why appropriate off-loading must be done in order for the ulcer to heal quickly. Once you have had one ulcer, you are at a higher risk of another one, so treat your feet very carefully. Fragile, newly healed skin will break down easily if feet are not protected from high pressure. Your doctor may prescribe specially fitted shoes or inserts to continue to off-load your foot and protect it. Plan to wear your diabetic footwear for all of your activities including social events. Not all ulcers are infected. However, it’s important for you to recognize the signs of infection in a diabetic foot ulcer (See previous article). If you have signs of infection, your doctor will take cultures from your wound to see what type of infection you have and which antibiotics will work. Mild to moderate infections can be treated on outpatient basis. For severe infection, you’ll need to be hospitalized. 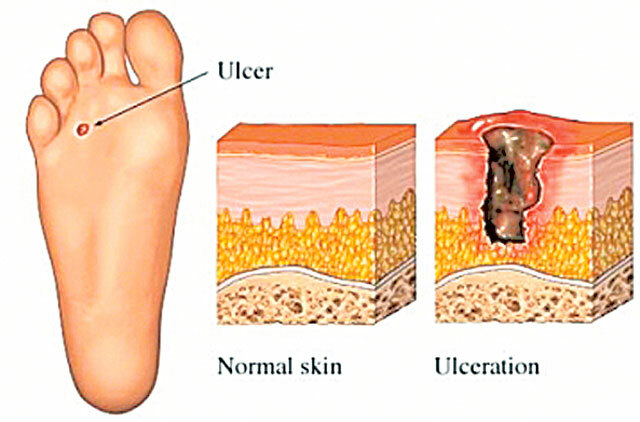 Poor circulation to the ulcerated area can cause delayed healing. Your healthcare provider will assess circulation in your feet using non-invasive tests, and may refer you to a vascular surgeon if the circulation is poor. Rarely used in chronic non-healing diabetic foot ulcers. A vacuum device is used to remove excess fluid from the wound. Excess fluid can cause delayed wound healing. Good wound care- Keeping the dressing dry and clean, changing it regularly as advised by your doctor. Wear your off-loading device AT ALL TIMES- The ulcer will not heal if the pressure is not relieved. Wearing your off-loading device for every step will give you the best chance to heal your ulcer quickly. In conclusion, as a diabetic it is very important for you to learn as much as possible about routine diabetic foot care as it plays the biggest role in preventing foot ulcers. 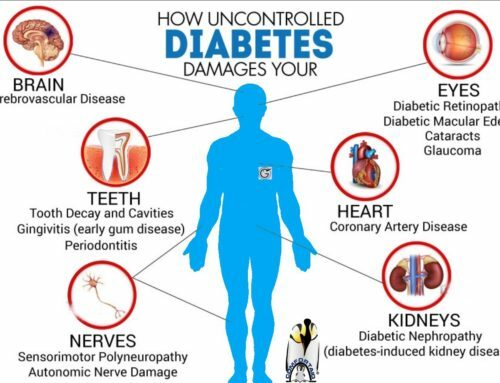 How diabetes effects my Feet? How to take care of my feet? Great article and very comprehensive. Diabetic foot problems should be noticed as soon as they starts showing symptoms. Diabetic foot problem should not ignored but treated under some professional help. I am going to send this information to him. Fairly certain he’s going to have a good read. Thank you for liking out posts. We look forward to be of service to you. I would like to express thanks to this writer just for rescuing me from such a circumstance. Right after browsing throughout the the web and meeting recommendations which are not helpful, I believed my life was done. 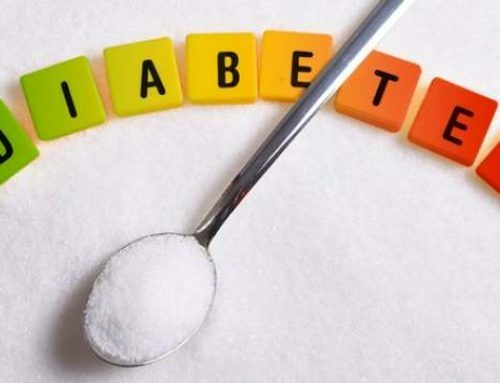 Living without the presence of solutions to the issues you have resolved as a result of the post is a critical case, and the kind that might have adversely damaged my life if I had not come across your diabetes web blog. Your ability and kindness in controlling a lot of things was precious. I am not sure what I would’ve done if I had not encountered such a stuff like this. I’m able to at this time look ahead to my future. Thanks a lot so much for your specialised and effective guide. I will not think twice to refer your blog to anyone who wants and needs counselling on this problem. Spot on with this write-up, I really assume this website needs way more consideration. I will most likely be again to read way more, thanks for that info. I precisely desired to appreciate you all over again. I do not know what I might have done without the smart ideas discussed by you relating to my condition. It previously was a scary condition for me, nevertheless encountering a new expert tactic you processed that made me to weep with joy. I am happy for this information and even hope that you really know what an amazing job you happen to be providing training others by way of a site. I am just commenting to let you know of the wonderful discovery my friend’s child undergone browsing your web site. 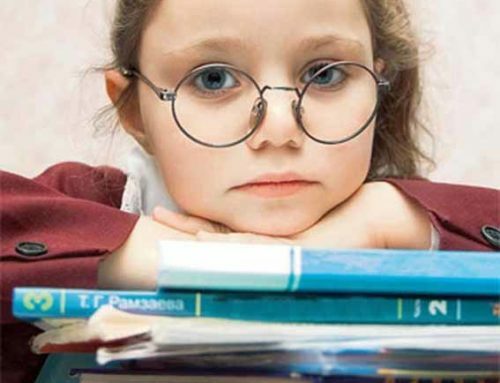 She mastered a good number of things, which included how it is like to have a marvellous coaching character to get the others quite simply learn about specific gruelling matters. You actually surpassed visitors’ expected results. Thank you for producing such beneficial, safe, revealing and fun guidance on the topic to Tanya. Great stuff! Very Hard to find this type of data anymore. Not clear why. I do have a few questions but want to re-read first before typing something really dumb. Appreciate it. Hi to all, how is all, I think every one is getting more from this website, and your views are pleasant and designed for new users. 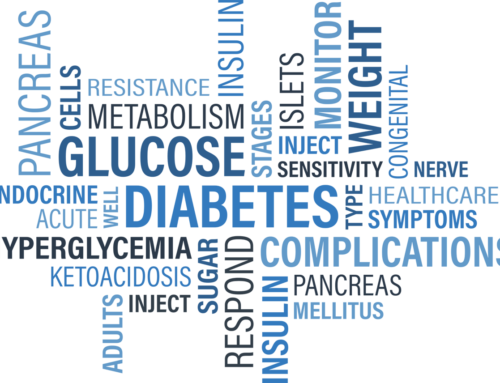 For most recent diabetes information you have to visit world-wide-web and on the web I found this gluxus site as a best site for most recent diabetes updates. I needs to spend some time learning more or understanding more about diabetes. Thanks for excellent information I was looking for this information for my health. I pay a visit day-to-day a few websites and websites to read articles, except this web site gives feature based posts. We are a gaggle of diabetes volunteers and starting a brand new scheme in our community. Your site provided us with useful information to work on. You have done a formidable process and our entire community shall be grateful to you. That is a good tip on diabetes particularly to those fresh to the blogosphere. You actually make it seem so easy with your presentation but I find this diabetes matter to be really something which I think I would never understand. It seems too complicated and very broad for me. Very nice post. I just stumbled upon your diabetes weblog and wanted to say that I’ve truly enjoyed surfing around your blog posts. 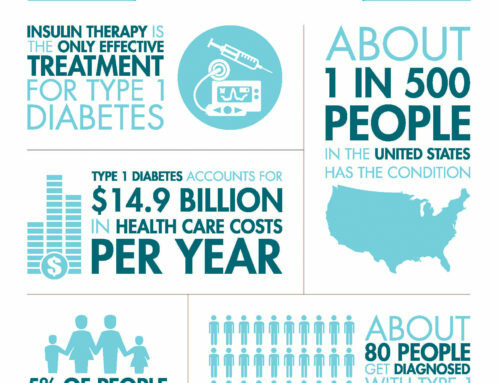 Thank you for sharing your thoughts on diabetes. I really appreciate your efforts and I am waiting for your further write ups on this topic. thanks once again. Good day I am so glad I found your diabetes site, I really found you by mistake, while I was browsing on Digg for something else, Regardless I am here now and would just like to say thank you for a fantastic post and a all round enjoyable blog (I also love the theme/design), I don’t have time to look over it all at the moment but I have bookmarked it and also included your RSS feeds, so when I have time I will be back to read a great deal more. Hi would you mind letting me know which hosting company you’re working with? I’ve loaded your blog in 3 completely different internet browsers and I must say this blog loads a lot faster then most. Can you suggest a good web hosting provider at a honest price? Greetings from California! I’m bored to death at work so I decided to check out your blog on my iphone during lunch break. I enjoy the diabetes knowledge you present here and can’t wait to take a look when I get home. I’m surprised at how fast your blog loaded on my cell phone ..I’m not even using WIFI, just 3G .. Anyways, good site! Hi would you mind letting me know which hosting company you’re working with? I’ve loaded your blog in 3 completely different web browsers and I must say this blog loads a lot quicker then most. Can you suggest a good internet hosting provider at a honest price?